"3:16" redirects here. For other uses, see 316 (disambiguation). In Exodus 4:22, the Israelites as a people are called "my firstborn son" by God using the singular form. In John, the focus shifts to the person of Jesus as representative of that title. 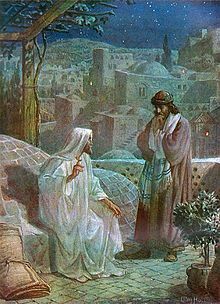 The verse is part of the New Testament narrative in the third chapter of John in the discussion at Jerusalem between Jesus and Nicodemus, who is called a "ruler of the Jews". (v.1) After speaking of the necessity of a man being born again before he could "see the kingdom of God", (v.3) Jesus spoke also of "heavenly things" (v.11-13) and of salvation (v.14-17) and the condemnation (v.18,19) of those that do not believe in Jesus. "14 And as Moses lifted up the serpent in the wilderness, even so must the Son of man be lifted up: 15 That whosoever believeth in him should not perish, but have eternal life." (John 3:14-15) Note that verse 15 is nearly identical to the latter part of John 3:16. A representative sample of published Bible translations renders it as follows. (It is worth noting that since this is perhaps the best-known verse, many translations have tried to maintain a traditional rendering). C1, Greek Original Koine Greek Οὕτως γὰρ ἠγάπησεν ὁ θεὸς τὸν κόσμον, ὥστε τὸν υἱὸν τὸν μονογενῆ ἔδωκεν, ἵνα πᾶς ὁ πιστεύων εἰς αὐτὸν μὴ ἀπόληται ἀλλ᾽ ἔχῃ ζωὴν αἰώνιον. Houtōs gar ēgapēsen ho theos ton kosmon, hōste ton huion ton monogenē edōken, hina pas ho pisteuōn eis auton mē apolētai all᾽ echē zōēn aiōnion. Hāḵanā gér ʼaḥeḇ ʼalāhā lʻālmā ʼaykanā dlaḇreh yḥyḏāyā yetel dkul man damhaymen beh lā naḇaḏ élā nehwuwn leh ḥayé dalʻālam. C4, Latin Vulgate Sic enim Deus dilexit mundum, ut Filium suum unigenitum daret: ut omnis qui credit in eum, non pereat, sed habeat vitam æternam. C14, Middle English Wycliffe's Bible For God louede so the world that he ȝaf his oon bigetun sone, that ech man that beliueth in him perische not, but haue euerlastynge lijf. C16, Protestant Tyndale Bible For God so loveth the world, that he hath given his only son, that none that believe in him, should perish: but should have everlasting life. C16, Roman Catholic Douay–Rheims Bible 1899 American Edition For God so loved the world, as to give his only begotten Son; that whosoever believeth in him, may not perish, but may have life everlasting. C17, replaced Latin as a long-lasting standard Authorized King James Version For God so loved the world, that he gave his only begotten Son, that whosoever believeth in him should not perish, but have everlasting life. C19, forerunner of modern version Revised Version For God so loved the world, that he gave his only begotten Son, that whosoever believeth on him should not perish, but have eternal life. C20, dynamic equivalence Good News Translation For God loved the world so much that he gave his only Son, so that everyone who believes in him may not die but have eternal life. C20, in-between approach, best-seller New International Version For God so loved the world that he gave his one and only Son, that whoever believes in him shall not perish but have eternal life. C21, formal equivalence English Standard Version (unchanged from RSV) For God so loved the world, that he gave his only Son, that whoever believes in him should not perish but have eternal life. C21, paraphrase The Message This is how much God loved the world: He gave his Son, his one and only Son. And this is why: so that no one need be destroyed; by believing in him, anyone can have a whole and lasting life. C21, "optimal equivalence" Christian Standard Bible For God loved the world in this way: He gave his one and only Son, so that everyone who believes in him will not perish but have eternal life. Recent translation scholarship has struggled most with the Greek adverb οὕτως (houtos) which traditionally has been simply translated as "so" as in "so loved" in the KJV. Theologians Gundry and Howell believe that the sense and syntax of the Greek Οὕτως…ὥστε make it likely that the author of the Gospel of John is emphasizing both (a) the degree to which God loved the world as well as (b) the manner in which God chose to express that love—by sending his only son. Gundry and Howell write that the Οὕτως term more frequently refers to the manner in which something is done (see BDAG 741–42 s.v. οὕτω/οὕτως). However, they add that the ὥστε clause that follows Οὕτως involves the indicative—meaning that it stresses an actual but usually unexpected result. They conclude that the sense and syntax of the Greek construction here focuses on the nature of God's love, addressing its mode, intensity, and extent. Accordingly, it emphasizes the greatness of the gift God has given. There are other scholars agreeing with this assessment. "The 'so' (houtos) is an adverb of degree which points toward the clause which follows and here serves to express the idea of infinity, a love that is limitless, that is fully adequate." "The Greek construction…emphasizes the intensity of the love." rather, in order that the world might be saved through him. David Pawson challenged the meaning and interpretation of the verse in his 2007 book Is John 3:16 the Gospel? John 3:16 printed on the bottom rim of an In-N-Out Burger paper cup. Cultural references to this verse are manifold. Some people (such as the Rainbow Man) display the reference in large letters at sporting events, seeking the attention of fellow fans, the staff controlling the venue's giant video screens and, if the game is televised, the television audience. The Heisman-winning American football player Tim Tebow printed this reference (among other Bible verses) on his eye black, notably during the 2009 BCS championship. Exactly three years later on January 8, 2012, was the game that would become known as "The 3:16 game", where Tebow threw for 316 yards in a playoff upset against the Pittsburgh Steelers; a game in which measurements of 3, 16 and 31.6 were also noted, "John 3 16" became the top Google search in the US. Professional wrestler "Stone Cold" Steve Austin's marquee catchphrase ("Austin 3:16") originated as a reference to John 3:16. Computer scientist Donald Knuth is the author of 3:16 Bible Texts Illuminated, in which he examines the Bible by an analysis of chapter 3, verse 16 of each book. Each verse is accompanied by a rendering in calligraphic art, contributed by a group of calligraphers under the leadership of Hermann Zapf. 3:16 was chosen because of this key passage in John. ^ "multiple Greek and English versions including Strong's numbers". Studybible.info. Retrieved 2014-05-20. ^ a b Gundry, Robert H. and Russell W. Howell. "The Sense and Syntax of John 3:14-17 with Special Reference to the Use of Οὕτως…ὥστε in John 3:16." NovT 41 : 24-39). ^ George Allen Turner and Julius R. Mantey, The Gospel according to John (The Evangelical Commentary on the Bible 4; Grand Rapids: Eerdmans, n.d.) 98. ^ D.A. Carson, The Gospel according to John (Leicester: Inter-Varsity/Grand Rapids: Eerdmans, 1991) 204. ^ br. Matej Nastran, OFMCap (2009-12-17). "Good News Bible online version". Biblija.net. Retrieved 2014-05-20. ^ "John 3:16 trends again thanks to Tim Tebow". CBS Sport. January 9, 2012. Archived from the original on 2012-01-21. ^ Tim Tebow’s 316 Passing Yards Evokes Biblical Number, Time, January 9, 2012. Wikimedia Commons has media related to John 3:16.